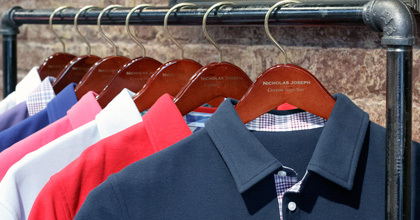 Nicholas Joseph’s tailored polos. Get some. When it comes to summer staples, the polo shirt — lightweight, clean and easy — is a basic necessity. But woe to the Chicagoan who wears a polo that’s oversized. You look like a collared cereal box, dude. Get the fit right with Nicholas Joseph and their just-launched custom polo shirt line, available now for your warm weather ramblings. The guys at Nicholas Joseph have been outfitting Chicago with bespoke suiting for nearly a decade now, and their first foray into the casual is just as sharp. Think soft, breathable cotton piqué. Tailored fit. Custom styling options from the collar down to the inside cuff. Great for boating. Great for casual Fridays. Great for casual anydays on the links. Book an appointment to peruse all your options. You’ll want a close fit. Not restrictive, but close. Sleeves cut slightly high and tight. It’ll look good paired with chinos and a lightweight sports coat. And as for that sports coat, Nicholas Joseph does those, too. Plus trousers, dress shirts and, of course, suits.